Del Mar, CA (July 19, 2017)-Spiced Perfection put it all together in her third start to pick up the winners share of a Del Mar Maiden Special Weights on opening day. From the first crop of multiple grade one winning millionaire Smiling Tiger, the juvenile filly earned $36,000 to increase her lifetime earnings to $53,280. Her owners Dare To Dream Stable LLC (Michael Faber) also receive the $17,500 bonus for her being a Cal-bred. 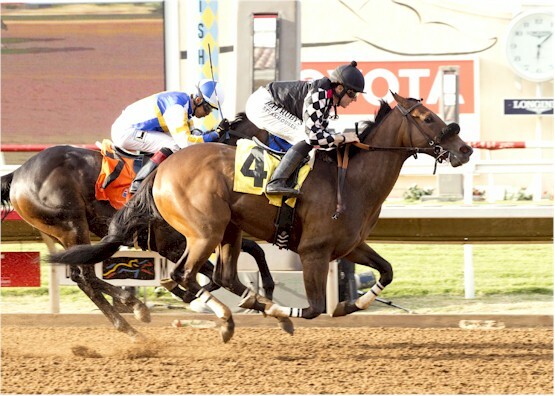 Bred by Premier Thoroughbreds LLC Spiced Perfection was a $50,000 Barretts March graduate and is out of the Pleasantly Perfect broodmare Perfect Feat. Smiling Tiger stood for $4,000 in 2017 and is the 2017 California’s leading freshmen sire with progeny earnings over $125,000. To date he has sired two winners and two stakes placed juveniles. He has two fillies consigned to the Del Mar Yearling Sale hip 51 out of Finish Rich in Nyc and hip 32 out of Alpenwald. Also selling at the Northern California Yearling and Horses of Racing Age Sale on Tuesday, August 15 at Alameda County Fairgrounds in Pleasanton, are hips 47 Smiling Tiger out of Mulberry Lane, 58 Smiling Tiger out of Purplengold, 65 Smiling Tiger out of Saturday’s Girl and 142 Double Tiger by Smiling Tiger out of Double Velvet.